Sven Middelkoop, scuba diving instructor in The Netherlands, offers some great tips for repairing dive gloves. Sven spends his time in the cold waters of The Netherlands, requiring watertight gloves for his cold water diving. Sven prefers the ease of wet gloves over the added hassle and insulation of dry gloves. "I love my 5mm Waterproof G1’s and seamless Camaro’s," he said. "Both pairs have a snug fit and keep me comfortably warm, as long as they are watertight! This is why I have been replacing them each 16 months or so due to one and the same issue: thumb wear and tear." It seems that the gloves are not a match for the bolt snaps on his gear resulting in torn thumbs with spot repairs and loose fabric while the rest of the gloves are in perfect condition. Luckily, Sven has found a fix which will allow him to get another season out of his favorite cold water diving gloves. 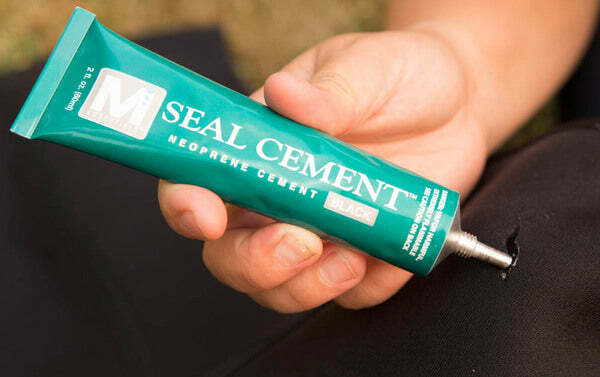 With just an iron, pair of scissors, Iron-On Neoprene Patch and Aquaseal NEO Contact Cement, Sven was able to repair his leaky gloves and use them immediately. STEP 1: Remove all loose fabric with scissors. If there is any old repair glue present, remove it as best you can by scrubbing with isopropyl alcohol. STEP 2: Apply Aquaseal NEO over the tears in the gloves. STEP 3: Reinforce the repair and the remaining fabric with Iron-On Neoprene Patch. Use the Iron-On fabric to cover the entire inner thumbs. 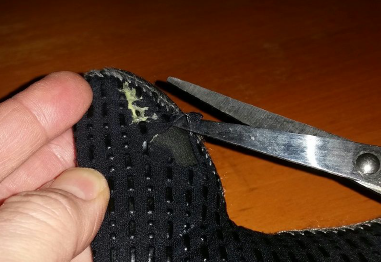 For both gloves, Sven cut an oversized thumb patch and an extra small one for the repaired spot of the right thumb. STEP 4: Time to heat up the iron; it was all smooth sailing from here, says Sven. After ironing on the small patch and the two oversized thumb pieces, the Iron-On fabric was cut to exact size and a little more precision ironing finished the job. Note the supplied protective sheet to protect the neoprene from the iron, which is included in the Iron-On Neoprene Patch kit. "The result is exactly what I had hoped for and the gloves are ready for another year of cold water diving," said Sven. Sven Middelkoop is a PADI dive instructor in The Netherlands. His diving consists of normal recreational dives dives and course dives. He prefers cold water diving where water temperatures can dip below 10 degrees Celsius. "Water temperatures can be challenging, but when you keep your head, your feet and your hands warm, winter drysuit diving is just fine."